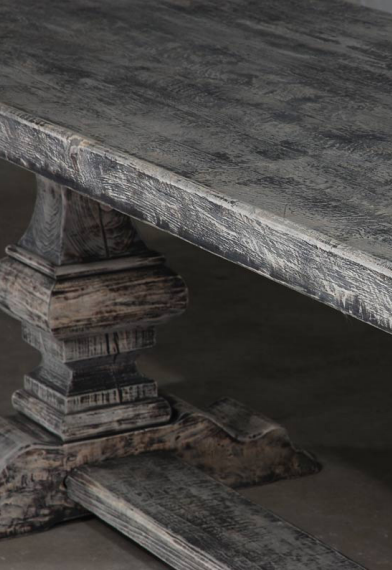 Our products are made from reclaimed elm timbers which are salvaged from abandoned industrial buildings. Each piece is handmade by a master carpenter using traditional methods. These pieces are unique by nature and will vary slightly. The rough hewn planks may have knots and gouges that enhance the character, including cracks, bows or potential movement. These imperfections are to be expected and contribute to the uniqueness of each one-of-a-kind piece. They are not considered defects. The reclaimed elm is sanded and planed. Sealant is not used, instead two coats of wax is applied prior to shipping. A complimentary can of wax is provided and we strongly suggest applying a third coat once the table is installed. In addition, we recommend waxing the table 3 – 4 times a year to insure the protective layer of wax is maintained. To avoid staining and damage to the finish, please use preventative measures. Always use coasters and placemats as sweating glasses can stain the table. If this occurs immediately wipe up spills with a damp cloth. Never use any type of harsh chemical or rough scrubbing material as these can remove the finish and cause further damage. Our concrete table tops are mixed and finished by hand. Concrete is a complex mixture of materials. Subtle variations in color, texture and overall appearance is to be expected. No two tops will be identical. Hairline cracks may appear within months or over many years, these are not structural failures or defects. 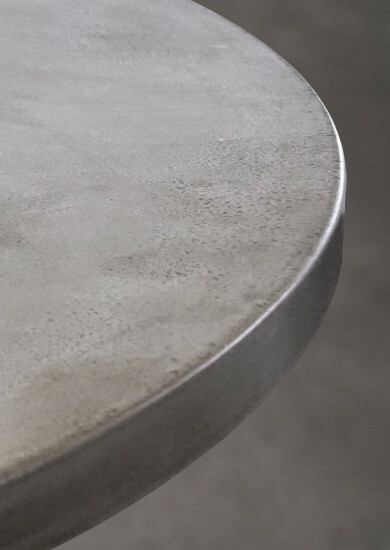 These imperfections are indicative of the natural beauty of concrete that ultimately enhances the piece providing unique attributes rather than mass produced perfection. Our concrete is sealed during the finishing process. The sealant bonds with the concrete and strengthens over time. Keep in mind this is only a barrier, this does not mean it is impervious to staining or damage. Concrete should only be cleaned with mild soap and water. Chemical cleaners and abrasives should be avoided as they can harm the surface. Prevention is the best way to care for concrete. Immediately wipe up spills such as wine, vinegar, lemon or tomato juice as the acidity can cause discoloration. Never cut on the surface or drag sharp objects.